Via: the email mail bag from my friend Betsy. 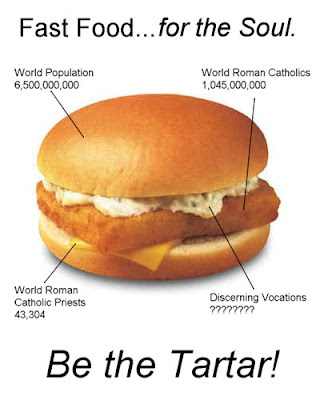 Since I'm in the seminary, that makes me Tartar sauce? You add flavor to the sandwich. So the rest of us are prefab fried fish? Uh...I think your stats are way wrong. The Wikipedia page on "Priesthood (Roman Catholic)" states there are 500,000 priests serving worldwide, not 43,000. Your data give a ration of 1 priest for every 24,100 Catholics or so, which can't possibly be right. I thought something was fishy about that statistic, considering there are roughly 30,000 Jesuits alone. Or maybe the advertisement is not coming out until 2010 and they did some future projections on the present data?